Stories are older than we can remember. Stories were told from generation to generation and existed before we could read and write, everywhere around the world. My question is: are the same storytelling techniques equally effective on all continents? The appeal of storytelling is, of course, that it touches the heart instead of the brain. It triggers emotion and doesn’t try to convince with hard facts and figures. Storytelling techniques help you show ‘why’ something is important, instead of trying to explain the ‘what’ behind a message or a product. To find out whether they have universal appeal, I want to take a closer look at some Chinese examples of storytelling. Just looking at recent videos and advertisements, Lunar New Year proves to be the perfect time to reminisce about Chinese culture. There were a couple that stood out. Chinese state television CCTV in November 2018 produced Chopsticks, a five-minute film about Chinese culture, values and – of course – food. You can watch it here. Chopsticks are so much more than just utensils, they stand for important Chinese values (importance of family, sharing a meal, caring for neighbors) and that was the message CCTV conveyed. The comments show CCTV managed to touch the hearts of Chinese people overseas. I do have some doubts as to whether the video appeals equally to a non-Chinese audience. I liked it a lot, but five minutes of happy, caring and sharing people is a bit too sweet to my taste. I would’ve liked a bit of prickly humor inserted somewhere, a counterpoint. The video conveys emotion about Chinese values, but as a story it’s not convincing to me. Luxury fashion brand Dolce & Gabbana also chose chopsticks as the topic of their ad campaign (watch it here). They were clearly not aware of the fact that chopsticks are not something to make fun of in China. Chinese consumers were not amused at all and called for a boycott of the brand (watch D&G’s apology to the Chinese people here, reminds me of Chinese self-criticism videos from decades ago, but making a comeback now). Definitely an example of global storytelling gone wrong. 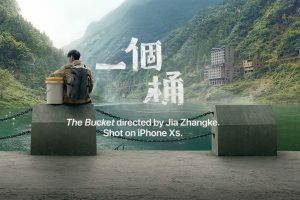 An example of storytelling with global appeal, also related to Chinese New Year celebrations, is The Bucket, a short video shot on iPhone XS (yes, it’s an ad) by famous director Jia Zhangke. The result is a film about New Year and the taste of home. Watch it here (with English and Chinese subtitles). The film is about a young man who visits his hometown for New Year. When he returns to the city where he works, his mother gives him a heavy bucket. It’s full of typical elements and symbols of Chinese culture. First and foremost: the importance of food and the ancestral home (for a moment I thought the bucket contained ‘yellow earth’ from home). Do watch the film to find out what is really inside. As you can deduct from my description, to me this is a perfect example of storytelling, building up expectations, making you want to see the end. This film also show the essence of what it means to be Chinese, and it put a smile on my face. As any good illustration of effective storytelling, it contains a narrative and conveys emotion, and on top of that, it explains why all these pictures people take are worth sharing (the ‘why’ of buying this particular brand). This video clearly works well for me. Does that mean there is such a thing as universal storytelling? Maybe. I’m going to further pursue this question in my next blogs, workshops and Meetups.